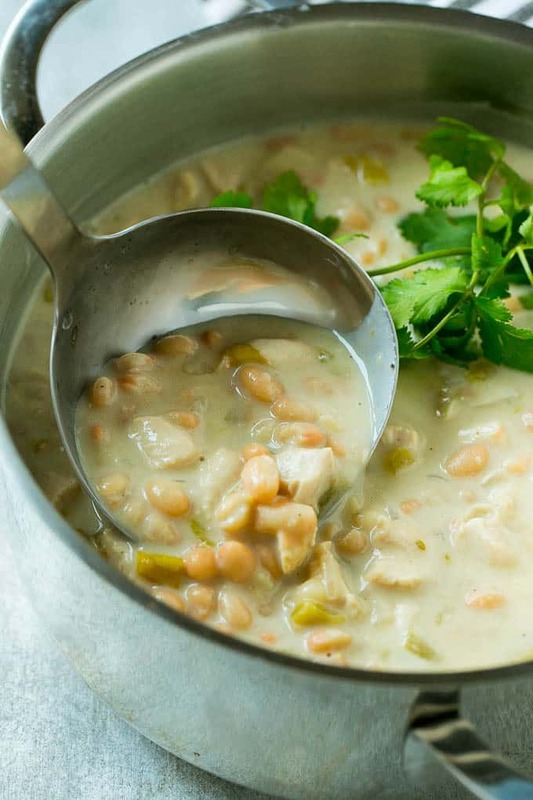 This easy white chicken chili is loaded with beans, chicken and green chiles, all in the most delicious creamy broth. A dinner option that’s perfect for a cold day! 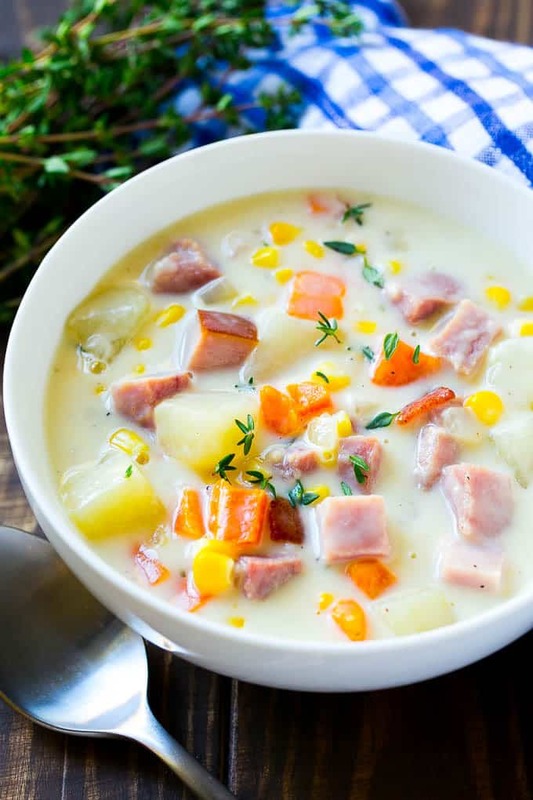 There’s nothing better than a bowl of hearty soup on a cold day. 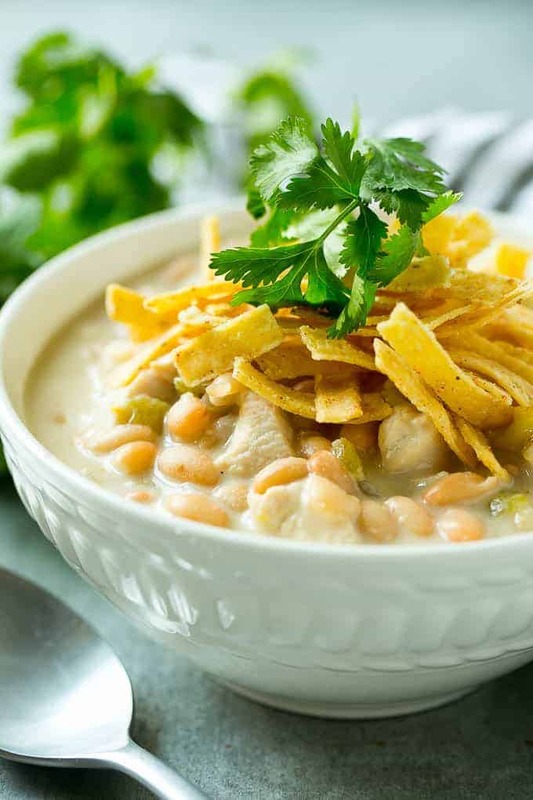 This white chicken chili is loaded with flavor and texture, and it’s ready in just 30 minutes! Serve this white chili with a variety of toppings or a side of cornbread for a meal the whole family is sure to love. This chili starts with garlic, onions and chicken breast. You’ll want to cut the chicken into small bite sized pieces, about 1/2 inch in size. After the chicken and aromatics cook down, chicken broth, white beans and green chiles are added to the mix, along with some spices. I use the smaller great northern beans in this soup, but you can also use white kidney beans (also known as cannellini beans) if you prefer. This recipe uses canned green chiles because of the convenience factor, I use mild chiles but if you prefer some heat, you can use medium or hot chiles, or even a can of diced jalapenos! The final ingredient for this chili is sour cream, which gets whisked into the broth at the very end of the cooking time. The sour cream adds richness and really brings all the flavors together, it’s the perfect counterpart to the spices and chiles. I like to top my white chicken chili with tortilla strips and cilantro, but other great options are shredded cheese, more sour cream, bacon, roasted corn, chopped tomatoes or even avocado. 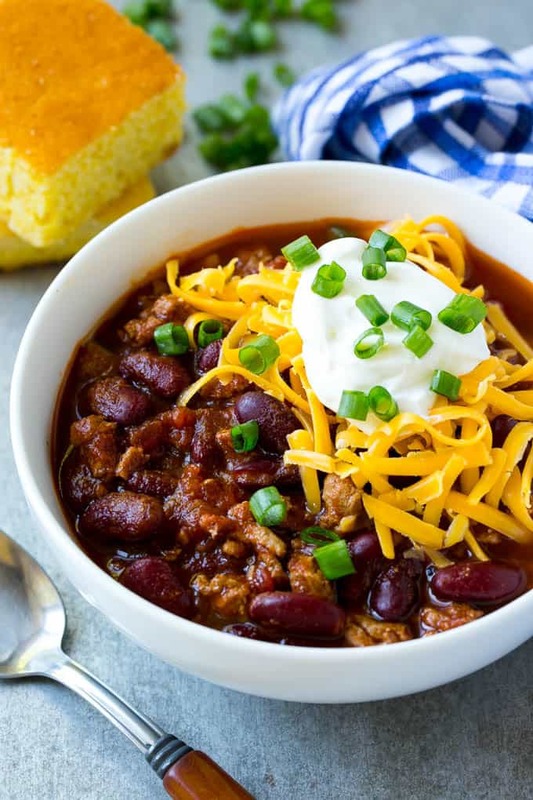 This chili can be made up to one day before you plan to serve it, and it freezes beautifully. If you’d like to freeze your chili, simply hold the sour cream and freeze the cooked chicken, bean and broth mixture in a resealable bag. Thaw the soup, bring to a simmer, then whisk in the sour cream right before serving. 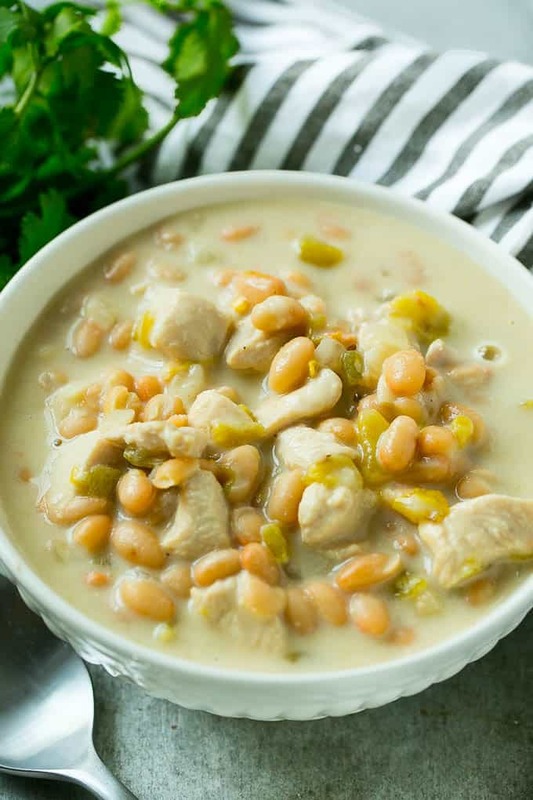 This easy white chicken chili is loaded with beans, chicken and green chiles, all in the most delicious creamy broth. A dinner option that's perfect for a cold day! Assorted toppings such as cheese, tortilla strips, chopped cilantro and avocado. Heat the olive oil in a large pot over medium heat. Add the onion and cook for 3-4 minutes until translucent. Add the chicken to the pot along with the cumin, coriander, salt and pepper. Cook, stirring occasionally, until chicken is cooked through, approximately 5 minutes. Add the chicken broth, green chiles and beans to the pot; bring to a simmer. Cook for 10 minutes. Remove the pot from the heat and whisk in the sour cream. My wife and daughter absolutely love this. Have to make double batches to keep it on hand. What are the implications of freezing it after the sour cream has been added? 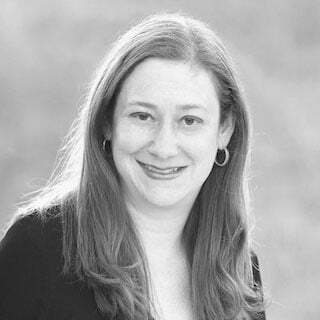 Alyssa, when is the garlic added?